Sidney Slon/Staff Photographer Redshirt sophomore Kevin Kelly earned a sixth-place finish this past weekend at the Storm Open in Las Vegas. The Bearcats faced tough competition against top-ranked wrestlers this weekend in Sin City at the 2018 Cliff Keen Las Vegas Invitational, one of the most challenging college tournaments in the country. The huge event held over 300 wrestlers from 42 different teams, with approximately 115 ranked grapplers and a select few coming from the nation’s highest-ranked teams. Despite facing some rust early in the season, the team showed its potential to have consistent placing and success, with improvements from previous matches and seasons. At the invitational, redshirt freshman Lou DePrez shone through the competition with five wins and only two losses. Ohio State senior Myles Martin and redshirt senior Drew Foster of Northern Iowa were the only two to defeat DePrez. Yet, he went on to down sophomore Jelani Embree of Michigan and, eventually, nationally ranked sophomore Max Dean of Cornell University to earn his placement on the podium. Additionally, at the Storm Open, four Bearcats were able to earn spots on the podium, signifying the development that the team has undergone. Freshman Christopher Barker registered decisions over redshirt junior Nick Steed of Ohio University in round one and freshman Caleb Cass of Cleveland State University in the quarterfinals. 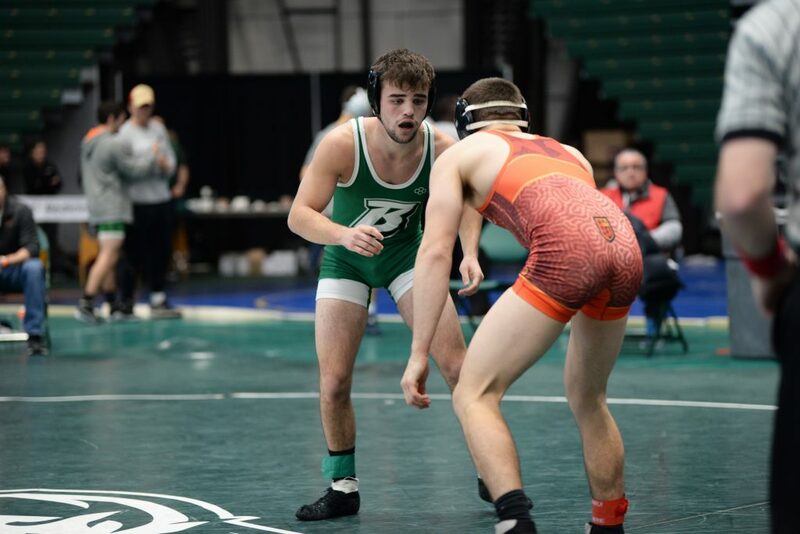 Losing by a pin down to freshman Jake Hart of Virginia Tech in the semifinals, Barker pushed on to receive his third-place spot in the 157-pound bracket over freshman Lavinsky Collins of Clarion University, bringing home a fulfilling win to the Bearcats. Binghamton continued to place in different weight classes, with three other wrestlers taking home a sixth-place win at the Storm Open. Redshirt sophomore Kevin Kelly fell to redshirt sophomore Jackson Renicker of Michigan State University at the fifth-placement match in the 141-pound weight bracket. Freshman Michael Zarif fell to freshman Jackson Wrobel of West Virginia University in the fifth-place match as well for the 149-pound weight bracket. Redshirt senior Anthony DePrez turned in a victory in the second round against senior Willie Bivens of Clarion University, placing sixth in the 197-pound weight class. The Bearcats will return to the mats this Thursday, Dec. 6 on their home turf against University at Buffalo. The match is set to begin at 7 p.m. from the West Gym in Vestal, New York.